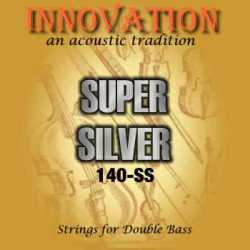 Innovation Super Silver Strings are often used for Rockabilly and Bluegrass – they’re a synthetic alternative to true gut strings. According to players who favor them, the 140-SS strings lean towards a more organic, gut-like tone than the Rockabilly Strings (also from Innovation). They have a round tone with a blunter attack and quick decay, giving a closer approximation of the gut tone – providing that ‘old-school’ flavor.